That's the working epitaph of 15-year-old Moon Landing. Not that Moon's death is imminent—far from it—but his thoughts have turned to gallows humor, as his world disintegrates along with his parents' marriage. His older brother skateboards through life with ease, but Moon is deeply troubled. Just as he is solving for romantic unknowns with a gorgeous older girl, Moon must contend with his father's sudden absence, his mom-gone-wild's sexcapades, and his best friends' curious penchant for self-destruction. Not to mention his newfound role in agitating to end an African guerilla's bloody rampage. To make sense of it all, Moon embarks on a quest to unravel the riddle of God's injustice to man. In this humorous and touching coming-of-age novel, Moon struggles to understand his parents—who they are, what brought them together, what broke them apart—and what that all means for his future. "I was instantly captivated by this funny and gritty book—a Catcher in the Rye for the selfie generation! Moon Landing is a darkly hilarious narrator of the contradictions and confusions of growing up. Thrilling, vivid, and deeply satisfying!" 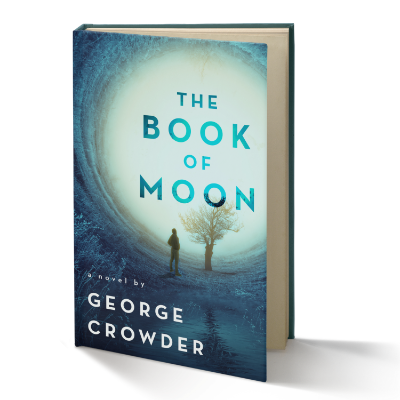 To get your hands on your very own copy of The Book of Moon, visit that little-known peddler of books and other goods, amazon.com. Enough already. Okay, I'll buy. This novel is a delight in so many ways: it is readable, the plotting rings true, and the characters are beautifully drawn. And it is precisely Crowder's characterization that elevates a nicely-written story to something much better. When I first met Mrs. Patel, whose one scene covers only two pages, she leaped off the page and wrapped herself around my brain indelibly. Moon and Moss are quickly elbowing themselves a place on my list of favorite characters of all time, right next to Scout Finch and Elizabeth Bennet. – Janice M.
From the moment I started I couldn't put it down, it made me scream out laughing and made me cry. Fantastic read. – Amanda M.
This surprising little book was so engrossing I finished it within hours of its arrival. I cannot say enough about how charming, funny and endearing the characters are; very wise and entertaining. I think this is one I will keep and read over and over. – Nancy W.
I couldn't stop until I finished, which screwed up my sleep schedule. George Crowder can write! Witty and profound, informative and full of heart. – Katherine S.
A YA book for adults! Part coming-of-age story, and part paean to the joys, ironies and frustrations of adolescence in modern America.